Our three lake rats with one of their favorite lifeguards, Chad Carter, currently an anchor/ reporter with KOIN Local 6. When my wife and I first visited Lake Oswego, Oregon, we drove by the Lake Grove Swim Park and jealously eyed the carefree folks who were spending their summer afternoon in a setting that waterfront homeowners pay millions for. 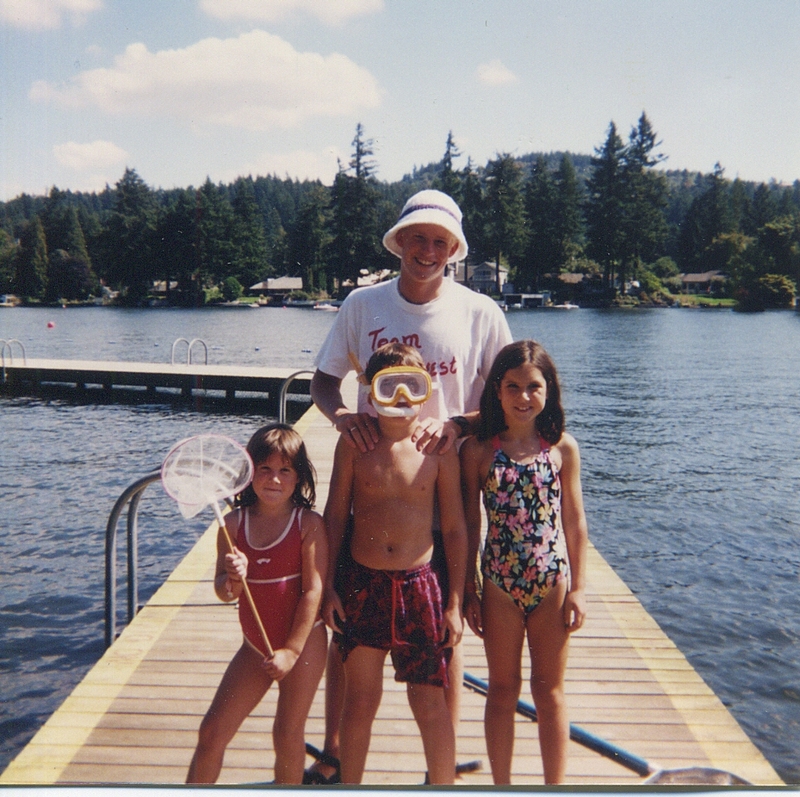 Little did we know the Lake Grove Swim Park would become our summer vacation spot for years to come once we bought a home and decided to live in Lake Oswego. Even though we lived on one of the canals, giving us access to the entire lake, when our kids were little, the swim park was where they wanted to be. What kid wouldn’t with these Top 10 Reasons to Love the Lake Grove Swim Park. 1. It’s a happy place. “Whenever we want to think of something happy, we think about the swim park,” explains Lake Oswego resident Katie Ferris who started hanging out there when she was 12 before continuing the tradition with her own four children. It’s a built-in summertime community with friends for the making—all you have to do is show up! 2. Lifeguards/Park Attendants. These high school/college age kids were the highlight for each of my lake rats. On any given day you could find one of my daughters shadowing her favorite guard or catch my son up at the snack shack in a furious card game of spit or speed with one of the cashiers. Life has come full circle. My oldest daughter is now a lifeguard. 3. Lifeguards again. For parents, having lifeguards puts your mind at ease. All swimmers are required to swim with a buddy, but lifeguards monitor each of the swimming areas. 4. The view. This is priceless real estate on the Lake Oswego waterfront. Spread out your blanket under the tree or on the dock and take it all in. 5. The lake. On a hot summer day, there’s nothing more refreshing than a dip in the lake. There are three swimming areas of graded depths with swim tests required to advanced to each level. Pool three features a diving board. 6. Swim lessons. They could be the best deal in town–two week sessions run from 11 a.m. to noon on weekdays and folks line up outside the swim park gate on registration day to get their kids enrolled. 7. Snack shack. In this world of “you are what you eat,” the snack shack is a throwback to the days we didn’t know that or at least didn’t care. Choose from candy bars, popcorn, hot dogs and slush puppies in a variety of syrupy sweet flavors. 8. Wading pool and play structure. It’s easy to keep the little ones entertained with a concrete wading pool, sand box and play structures (not to mention those slush puppies again). 9. Games. Leave a quarter for a deposit, and you can check out equipment to play ping pong, badminton, basketball or shuffle board. 10. Picnic spots. Shade person? Got that. Want to work on your tan? Got that. Barbecue grates, picnic tables…no wonder the swim park is a popular spot for dinner for two after a long day at work or Charlie’s seventh birthday party. Here’s just a little bit of history. The swim park was originally deeded to the Lake Grove School District by the Oregon Iron and Steel Company so that all the kids in the Lake Grove district could have access to the lake. In 1953 that district merged with the former Oswego School District to form what is now the Lake Oswego School District. Use of the park, however, is still restricted to residents who live within the original Lake Grove School District boundaries and pay an additional property tax toward the maintenance of the park. Residents need to show proof of residency to receive a park pass, good for the season. Hours: Open noon to 8 p.m. daily starting the first Saturday after LOSD schools close in June until 5 p.m. on Labor Day. Check out their website. Better yet, check out the park while there are still lazy summer days to savor. What’s your favorite reason for loving Lake Oswego?I’d love to hear from you and get your ideas. This entry was posted in Lake Oswego lifestyle and tagged Chad Carter, lake, Lake Grove Swim Park, Lake Oswego Oregon, Lake Oswego School District, lifeguards, summer, swim park. Bookmark the permalink. This is the 4th article, of yours I actually read through. Glad you enjoyed it. The Lake Grove Swim Park truly is a magical place…a throwback to a simpler time. I feel very fortunate my kids were able to grow up spending summer afternoons there.